We're all seeking comfort when it comes to dressing up, and this combination of a black leather biker jacket and a DSQUARED2 fringed scarf is an amazing example of that. Go for a pair of black leather casual boots to kick things up to the next level. Wear a dark brown leather barn jacket and a DSQUARED2 fringed scarf, if you want to dress for comfort without looking like a hobo. If you prefer relaxed dressing when it comes to fashion, you'll love this on-trend pairing of a dark green velvet blazer and a black scarf. 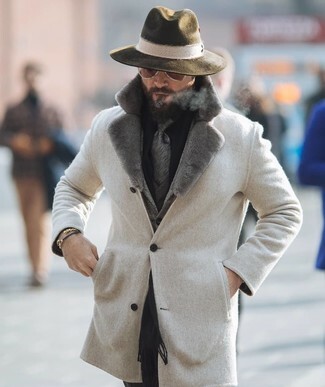 We're all seeking comfort when it comes to dressing up, and this combination of a camel overcoat and a black scarf is a great illustration of that. You could perhaps get a little creative in the footwear department and elevate your getup with black leather oxford shoes. Consider teaming a black trenchcoat with a DSQUARED2 fringed scarf for a weekend-friendly look. Got bored with this look? Enter black leather casual boots to shake things up. If you're all about being comfortable when it comes to dressing up, this combination of a beige fur collar coat and a DSQUARED2 fringed scarf from farfetch.com is just for you. We're all seeking comfort when it comes to dressing up, and this combination of a tobacco shearling jacket and a DSQUARED2 fringed scarf from farfetch.com is a wonderful example of that. You could perhaps get a little creative in the footwear department and lift up your ensemble with black leather chelsea boots. 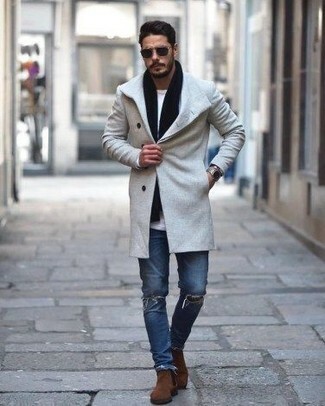 If you're all about relaxed dressing when it comes to your personal style, you'll love this easy combo of a grey overcoat and a DSQUARED2 fringed scarf. To add elegance to your outfit, complete with brown suede chelsea boots. 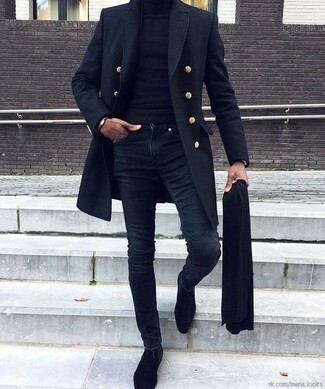 Wear a navy overcoat and a DSQUARED2 fringed scarf from farfetch.com, if you feel like functionality dressing without looking like you don't care. 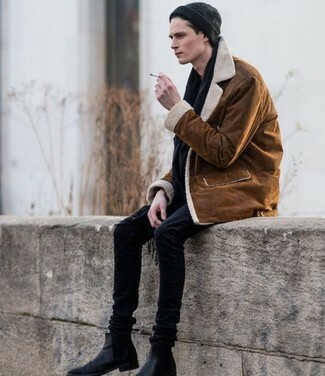 Kick up the cool of your getup by complementing it with black suede chelsea boots.